In small bowl, mix dressing ingredients. For each salad, use a 4- to 5-cup container. 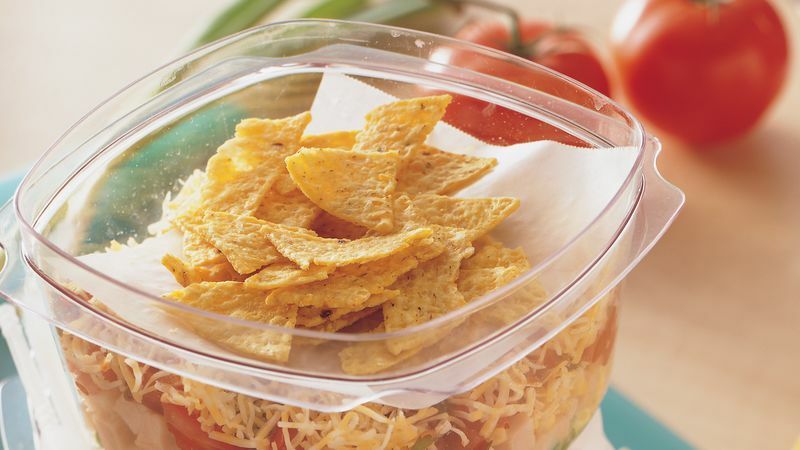 In each container, layer ingredients in this order: 1 1/2 cups lettuce, 1 tablespoon onions, 1/2 cup turkey, 1/4 cup corn, 1/2 cup tomatoes, 1/4 cup dressing and 1/2 cup cheese. Place small piece of waxed paper over each salad; sprinkle 1/2 cup chips on waxed paper. Cover; refrigerate up to 24 hours or salads can be tossed and served immediately. To serve, remove waxed paper; toss salads. The waxed paper is placed between the salad and the chips to keep the chips crisp. If you like, you could wrap them in a small piece of plastic wrap or a plastic bag instead.